By the divine grace of both Shri Dada Bhagwan and Gnanipurush Param Pujya Shri Kanudadaji and the heartfelt blessings of all the Aptaputras, Guru Purnima each year inevitability brings to light invaluable insights and illuminates solutions to life’s personal and collective challenges. Thanks to the devoted efforts of the Detroit area Mahatmas and their families last month we were all able to once again truly appreciate the boons from this auspicious celebration of the True Self! Below is a link to some of the many enlightening Satsangs offered by Aptaputras during the weekend. May these videos continue forward the spirit of Guru Purnima while we eagerly await gathering again next year in South Carolina! 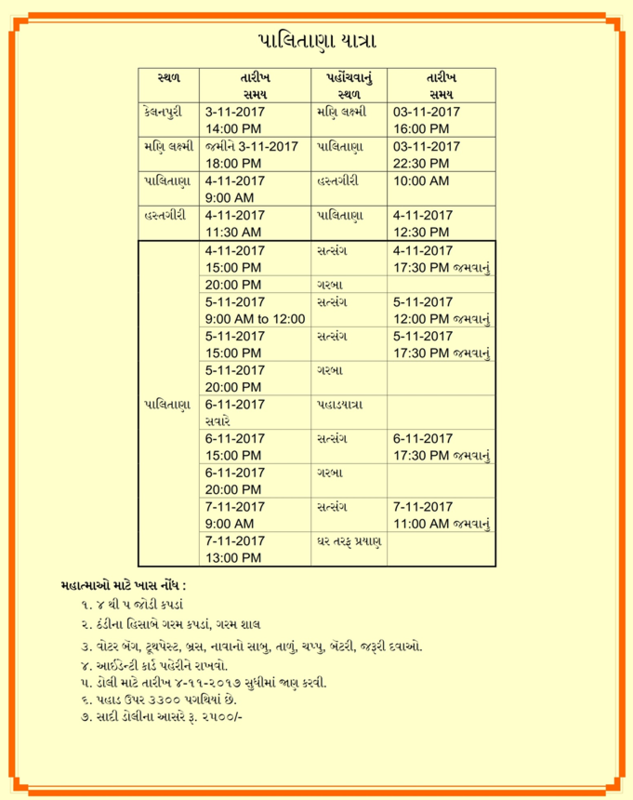 With the grace of PPS Dada Bhagvaan and Pragat Gnani Purush Pujya Shree Kanudadaji a Jatra to Palitana has been organized by Jai Sachchidanand Sangh in November 2017. Most Aptputras, Shree Kaviraj, and PPS Dadaji are expected to join also. A detailed schedule is included for your reference. We plan to leave Kelanpuri on Nov. 3rd returning on Nov. 7th. Mahatma Shree Prakashbhai Jain has booked a Dharmashala for NRI Mahatmas to provide accommodations for 50 mahatmas. We will provide accommodations on first come first basis. If we have more than 50, he has indicated that other arrangements can be made in near by Dharmashalas. We are investigating travel options by regular seating (Not a Sleeper) A/C bus and also Volvo. Volvo is very hard to get and the cost is twice as much or more. Volvo option is not available from Surat. If we get Volvo we will have to start our journey from Kelanpuri. We will give preference to Volvo bus based on availability. The travel distance from Kelanpuri to Palitana is about 6-7 hours. The cost is estimated at $150-$200 per person. Once we get the bus option confirmed we will revise the cost accordingly. Please send an E-mail to Shailesh J. Vakil at sjvakil47 to announce your interest. Also, send a $50 NON-REFUNDABLE deposit check payable to Shailesh J Vakil (by September 6) at 87 CONOVER ROAD, WEST WINDSOR, NJ 08550. I have to receive your deposit to reserve your spot. I need your email address for further communications. I plan to visit India from Sept. 9th thru October 11. I will collect more info to communicate with you ASAP. It is still not too late to register for Kirtan Bhakti in Knoxville, August 12-13. Please definitely plan to attend. USA : Jun 24 [PDT/-12:30hr] 21:30 hr to 23:30 hr. USA : Jun 25 [EDT/-9:30hr] 00:30 hr to 02:30 hr. UK : Jun 25 [BST/-4:30hr] 05:30 hr to 07:30 hr. AUS : Jun 25 [AEST/+4:30hr] 14:30 hr to 16:30 hr. NZ : Jun 25 [NZST/+6:30hr] 16:30 hr to 18:30 hr.